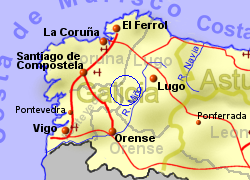 Located approximately 45Km south west of the city of Lugo, and 80Km east of Santiago de Compostela, the village of Antas de Ulla sits in the centre of Galicia region. The peaseful surrounding area is agricultural, mostly of grassland, dotted with patches of woodland (predominantly chestnut, oak and pine). Although the village is quite scattered, you will find a small selection of shops and bars in its centre. 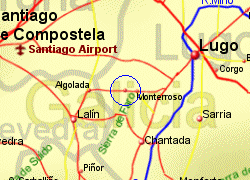 Further facilities are available in the town of Monterroso, 5Km to the east. 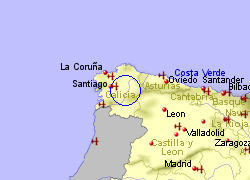 Map of the Antas de Ulla area.